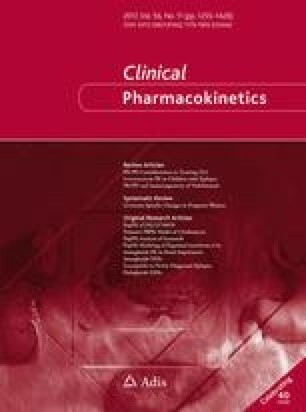 Physiologically-based pharmacokinetic (PBPK) modeling is a powerful tool used to characterize maturational changes in drug disposition to inform dosing across childhood; however, its use is limited in pediatric drug development. Access to pediatric pharmacokinetic data is a barrier to widespread application of this model, which impedes its development and optimization. To support the development of a pediatric PBPK model, we sought to leverage opportunistically-collected plasma concentrations of the commonly used antibiotic clindamycin. The pediatric PBPK model was optimized following development of an adult PBPK model that adequately described literature data. We evaluated the predictability of the pediatric population PBPK model across four age groups and found that 63–93% of the observed data were captured within the 90% prediction interval of the model. We then used the pediatric PBPK model to optimize intravenous clindamycin dosing for a future prospective validation trial. The optimal dosing proposed by this model was 9 mg/kg/dose in children ≤5 months of age, 12 mg/kg/dose in children >5 months–6 years of age, and 10 mg/kg/dose in children 6–18 years of age, all administered every 8 h. The simulated exposures achieved with the dosing regimen proposed were comparable with adult plasma and tissue exposures for the treatment of community-acquired methicillin-resistant Staphylococcus aureus infections. Our model demonstrated the feasibility of using opportunistic pediatric data to develop pediatric PBPK models, extending the reach of this powerful modeling tool and potentially transforming the pediatric drug development field. The online version of this article (doi: 10.1007/s40262-017-0525-5) contains supplementary material, which is available to authorized users. The assay measuring clindamycin concentrations was performed at OpAns Laboratory (Durham, NC, USA). This work was funded by the National Institutes of Health (1R01-HD076676-01A1; MCW). Christoph P. Hornik receives salary support for research from the National Center for Advancing Translational Sciences of the National Institutes of Health (UL1TR001117) and the US government for his work in pediatric and neonatal clinical pharmacology (Government Contract HHSN267200700051C, PI: Benjamin under the Best Pharmaceuticals for Children Act). Andrea N. Edginton receives support for research from the National Institutes of Health (1R01-HD076676-01A1; PI: Cohen-Wolkowiez). Kevin Watt receives support from the Pediatric Critical Care and Trauma Scientist Development Program (5K12HD047349) and the Eunice Kennedy Shriver National Institute of Child Health and Human Development (NICHD; 1K23HD075891, 2K24HD058735). Michael Cohen-Wolkowiez receives support for research from the National Institutes of Health (1R01-HD076676-01A1), the National Institute of Allergy and Infectious Diseases (HHSN272201500006I and HHSN272201300017I), the National Institute of Child Health and Human Development (HHSN275201000003I), the Biomedical Advanced Research and Development Authority (HHSO100201300009C), and industry for drug development in adults and children (http://www.dcri.duke.edu/research/coi.jsp). Daniel Gonzalez receives support for research from the NICHD (K23HD083465), the nonprofit organization Thrasher Research Fund (http://www.thrasherresearch.org), and from industry (Cempra, Inc. and Jacobus Pharmaceutical Company, Inc.) for drug development in adults and children. Huali Wu has no conflicts of interest to declare. The content is solely the responsibility of the authors and does not necessarily represent the official views of the National Institutes of Health. Clinical PK data used in this publication were collected during the POP01 clinical trial (ClinicalTrials.gov identifier: NCT01431326). The POP01 study protocol was reviewed and approved by the Institutional Review Board of each participating institution. Informed consent and assent, when applicable, was obtained from all participants enrolled in the POP01 clinical trial who contributed clinical PK data used in this study. DrugBank Version 4.5. Drug and drug target database. http://www.drugbank.ca. Accessed 6 May 2016.